Basses to the Balkans | The basses from the AU Chamber Singers are going to the Balkans in May 2015. Here's their story. 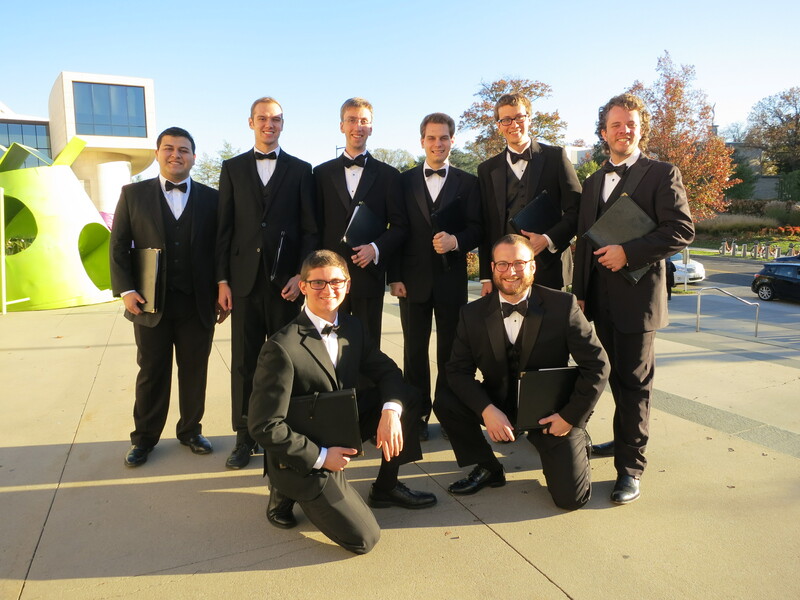 ~ The basses from the AU Chamber Singers are going to the Balkans in May 2015. Here's their story. Today is our last full day in the Balkans! We have had an amazing, exhilarating, exhausting, and thoroughly memorable time. The past few days in Bosnia-Herzegovina have been very memorable, starting with our concert in Trebinje and continuing with a short stay in Mostar and now concluding in Sarajevo. Matt wrote about the beautiful cathedral in Trebinje in his previous post, and after that concert we took the tour bus over to Mostar. 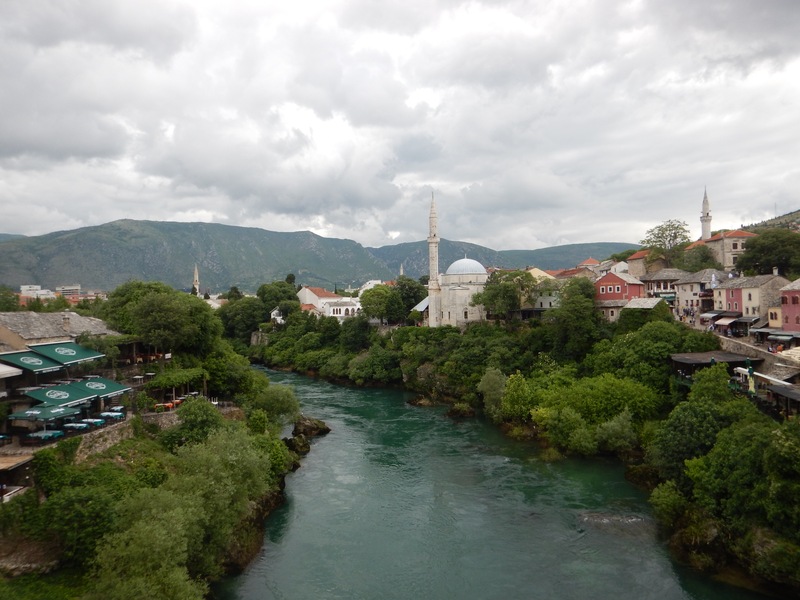 Mostar is a very interesting city, divided by a river into almost two cities, one ethnically Bosnian and the other ethnically Croatian. 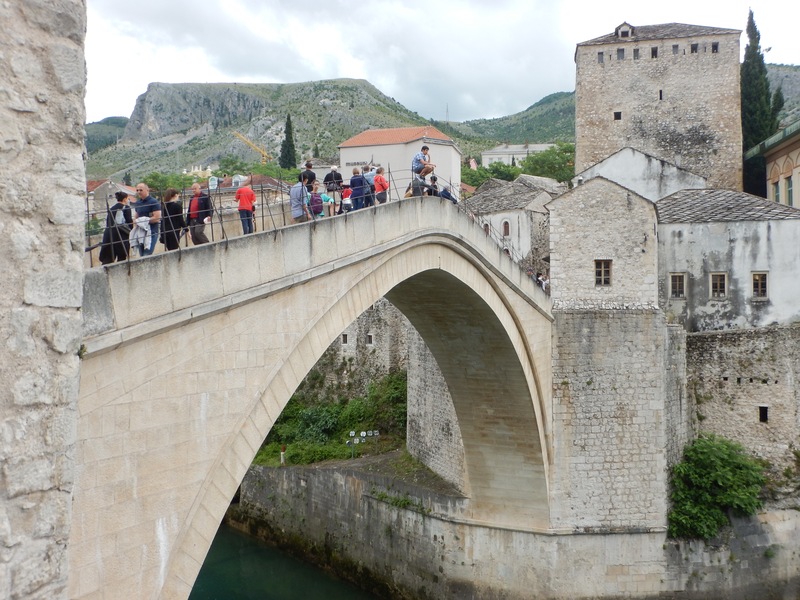 We explored both sides and were especially taken by the Stari Most, a 16th century bridge rebuilt in 2004 after being destroyed in the Croat-Bosniak War in 1993. 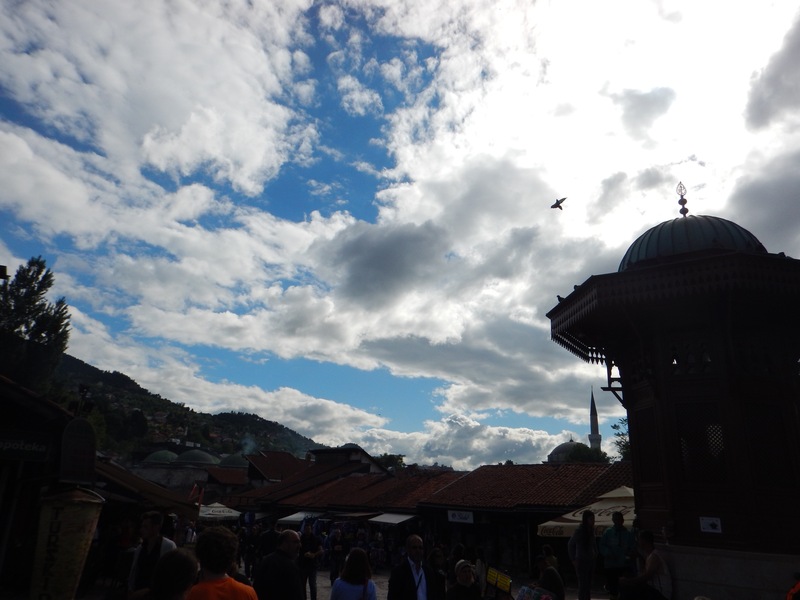 Sarajevo has been very fascinating as well. It was substantially affected by the wars of the 1990s, as we learned in our tour this morning of the Tunnel of Hope, an important supply line to Sarajevo when it was being sieged. Despite the recent history, the city has rebuilt well, and it maintains an impressive cultural vibrancy. 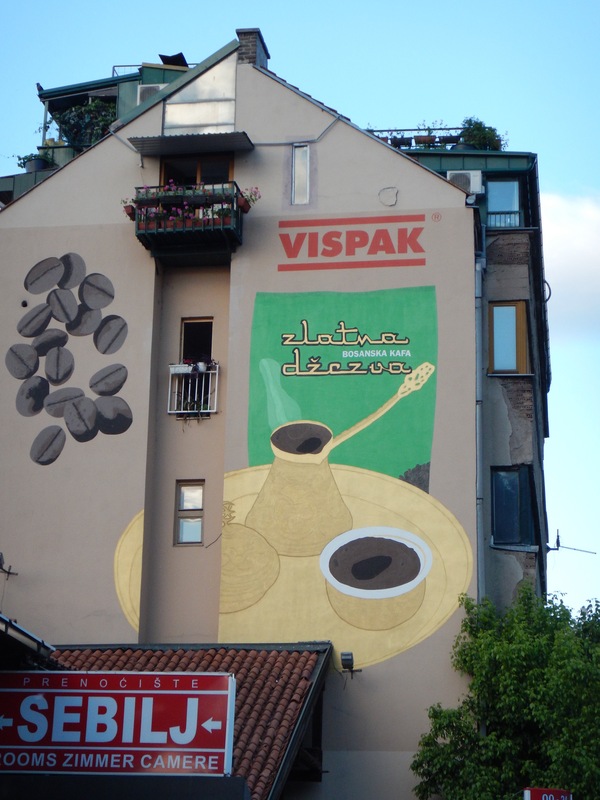 We have all enjoyed the extensive bazaar and the culinary offerings, from Sarajevsko beer to Bosnian coffee (their take on Turkish coffee). We have a final concert tonight, followed by a group dinner. Wish us luck! And stay tuned for a couple of future posts with recordings and photos. As we entered the second half of our tour, we drove up to the beautiful Hotel Adria in Dubrovnik, Croatia. Just when I thought that the scenic eye candy had to have peaked in Montenegro, the view from our hotel easily took the cake. Overlooking the beautiful blue waters of the port of Dubrovnik, our hotel had my jaw lying on the floor. 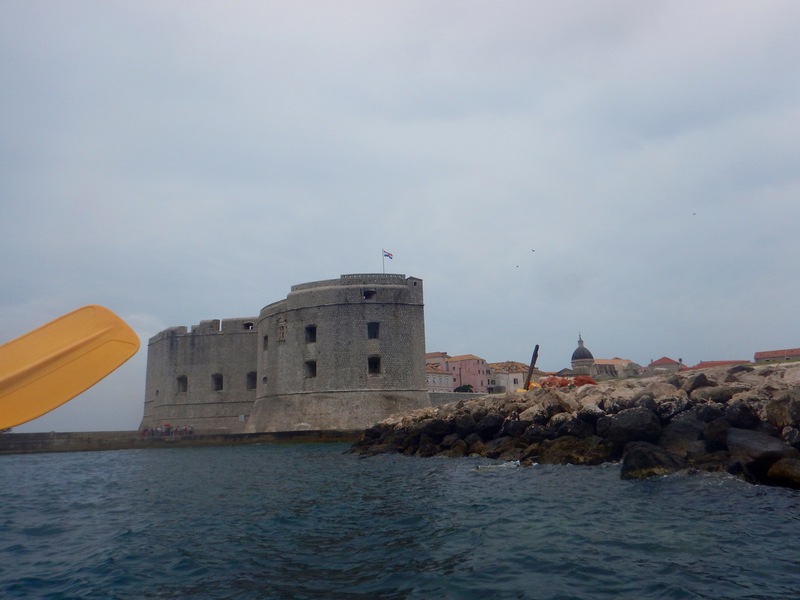 We immediately departed for Dubrovnik’s Old City, which many of you Game of Throne-ies might recognize as King’s Landing. As we approached the walls, I understood immediately why the minds of HBO felt that this was the perfect set. 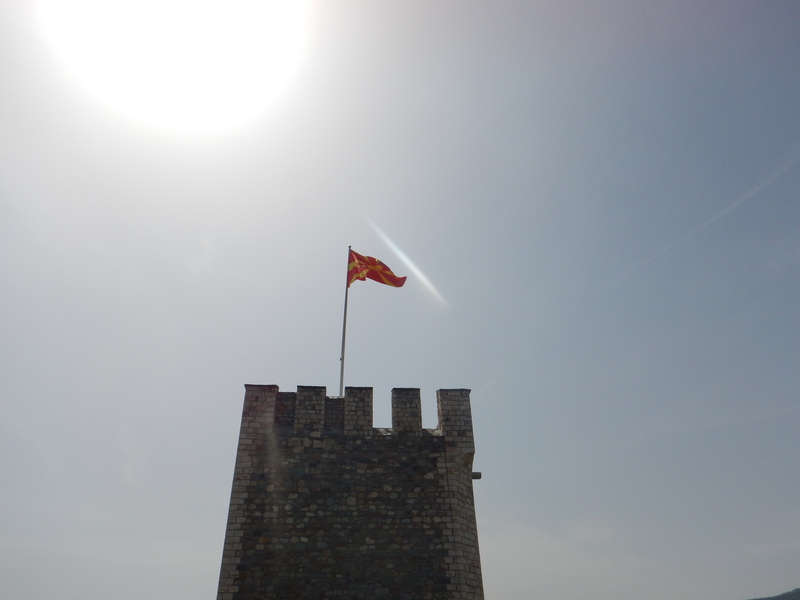 This medieval fortress was simply mind-blowing. Walking over the drawbridge made me feel like I had traveled back in time. Completely surrounded by medieval defenses and the crashing waves of the Adriatic Sea, it was no wonder that many thousands of people joined us in our hunt for the perfect picture on this picturesque day. We had the pleasure of walking along the tops of the walls, eating at the city’s finest restaurants, and then dancing in the main court through the sunset. One of the greatest highlights of this trip so far for me was kayaking along the edges of the walls the next day, feeling as if I were an enemy ship about to take the city by storm. Our concert yesterday took place in Trebinje, Bosnia: a small and quiet town about an hour away from Dubrovnik. Hidden in this small town was one of the most beautiful cathedrals I had ever seen. While the Cathedral of the Transfiguration was small, it was also quite mighty. Never had I seen such large murals covering every possible inch of the walls. The space looked and sounded beautiful. This concert was one of my favorites thus far, for I could feel the difference in the audience who came from a town of thirty one thousand people rather than a city of millions. It was a rather humbling experience, and I intend to take the priest up on his offer of returning someday. “Wow” was definitely the most frequently used word during our time in Montenegro. From the time we crossed the border into Albania, it only got better and better. Albania’s gentle sloping mountains and babbling brooks gave way to sharp, craggy faces, fortresses, and the stunning Adriatic coast. Unfortunately, the hotel we had booked was oversold, so we got “bumped” to the property next door, Hotel Splendid. I had been looking forward to the original hotel, and thought that any hotel that has to call itself splendid must not be. Luckily for us, I was wrong. The alternate accommodations were luxurious. 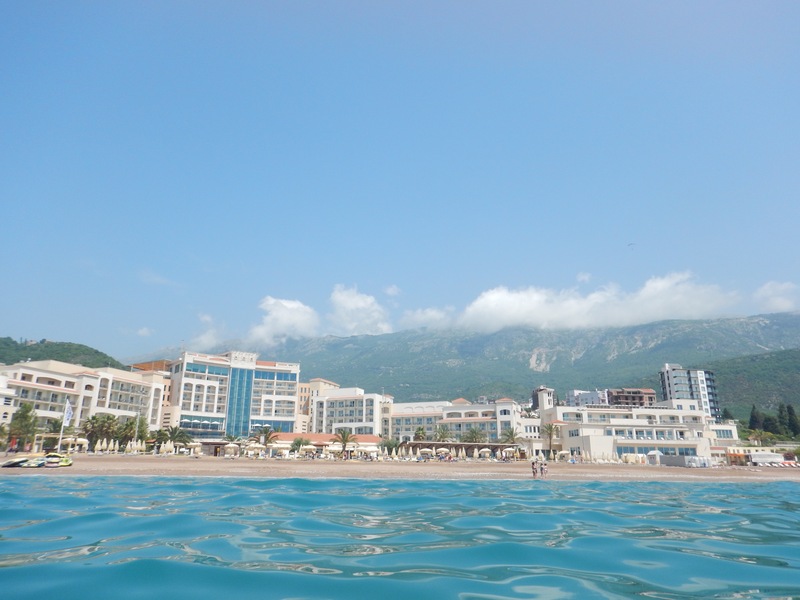 While some chose to go into the city center of Budva and explore, others chose to stay at the hotel, swim, relax, and take advantage of the spa. 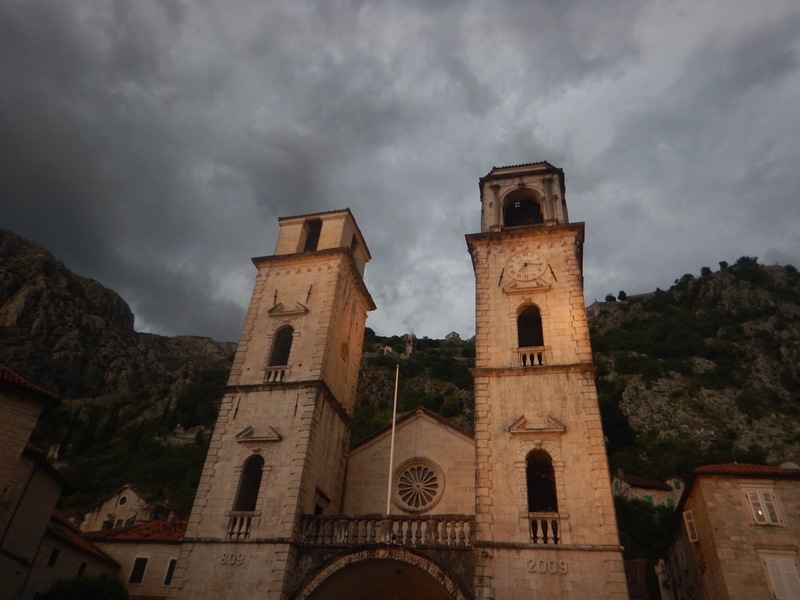 Yesterday, the wows continued in Kotor, a medieval walled city of a few thousand, with one church that had been in existence since the year 809. Kotor was ruled by the Venetians for several hundred years, and the locals will proudly tell you that they were never ruled by the Ottomans – which means that it’s visually very different from anything we’ve seen elsewhere. After the concert, we were honored with a reception that offered a chance for the choirs to get to know each other. Many of the basses spent time talking with Unity’s most prominent bass. The physicality of his performance was impressive – watching his chest cavity expand and the vertical space he was able to create to power that huge, resonant sound was certainly awe-inspiring. After our exciting entrance to the Balkans we gave our first concert in a small church in the center of Skopje. The program opened with a women’s choir singing a variety of liturgical music from the Orthodox tradition. We then took the stage and gave a great performance. 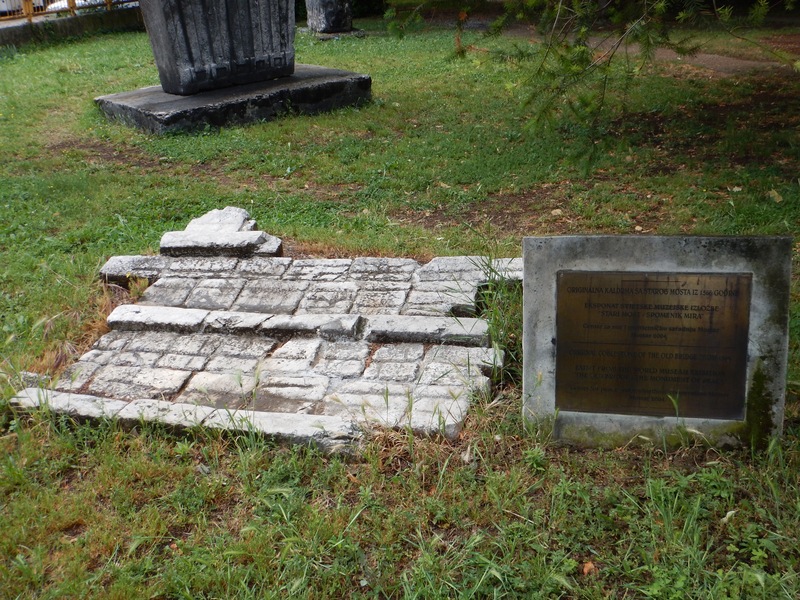 The eerie Australian “Kondallila” was well received, but nothing came close to the audience’s enthusiastic enjoyment of “Shto mi e milo,” a Macedonian folk song. The piece repeats a series of verses and choruses and the audience burst into applause after a single go around. Their strong emotional reaction certainly moved us all—there’s nothing so magical as joining in with a native audience for a folk song sing-along in a country far from home. Bidding Skopje and Macedonia a fond farewell, we headed next for Prishtina. We weren’t quite sure what to expect from this fledgling capital city, but we were definitely pleasantly surprised. 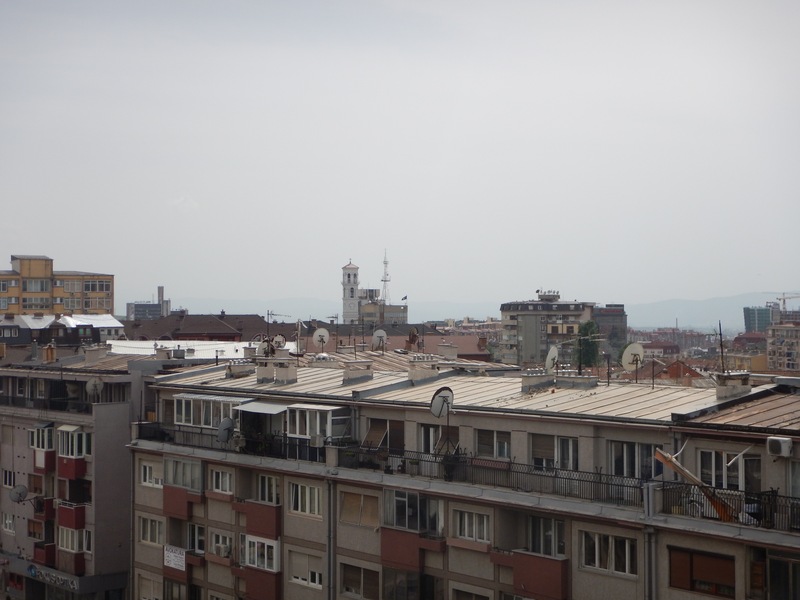 Apart from the difficulty of the Albanian language (Let me tell you, ‘thank you’ is tricky), the city had the small town atmosphere and general friendliness that makes one feel right at home. The food was exceptional—from the menu-less family style Tiffany’s to the traditional dishes served at Fast Food Five Plus. 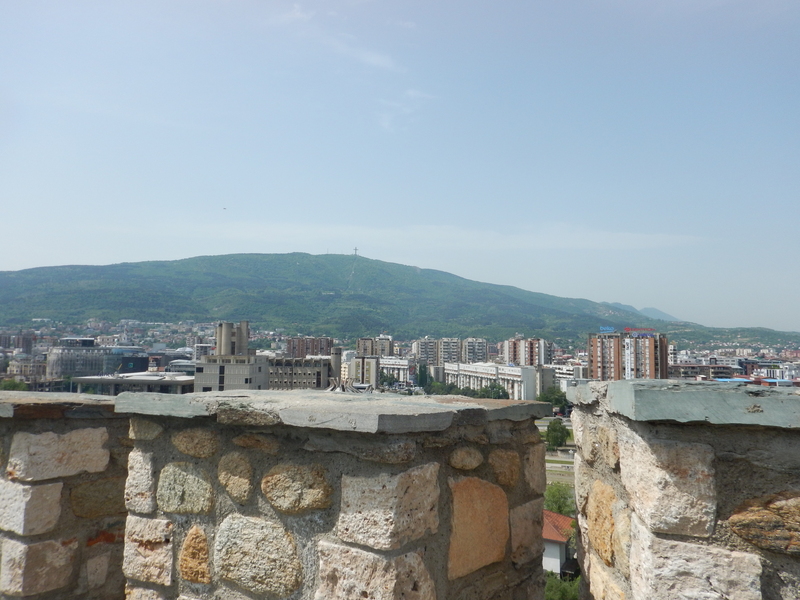 It was also a city filled with history, though it differed significantly from Skopje. Here, the centuries-old mosques contrasted with the burned out shell of an Orthodox cathedral, the parliamentary building glistened with brand-new glass, and the Catholic cathedral in which we would give our concert was definitely still under construction. And, of course, the peculiarities and complexities of western Balkan geopolitics couldn’t be missed—the Albanian flag flew perhaps even more often than the flag of Kosovo! And we all felt a little bit of home walking to the intersection of George W. Bush Avenue and Bill Clinton Street. The basses (and the rest of the AU Chamber Singers) travelled for a long time but finally made it to Skopje, Macedonia last night. We took a walking tour today to the city’s castle, called Kale (named such for the Turkish word for fortress, ‘kale’ – not the weird leafy green), where we got a good view of the second largest cross in the world, which sits on a nearby mountain. We also wandered the cobbled streets of the Old Bazaar and over the river on a historic stone bridge, admiring the many, many statues of the city. 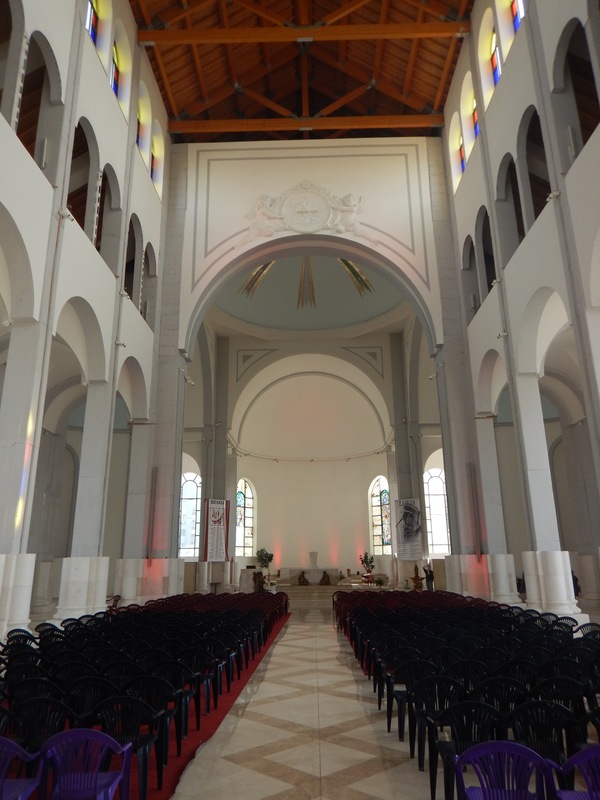 We are now prepping for our concert tonight, which will take place in a beautiful Catholic cathedral called Sveta Bogorodica, and it has a very nice acoustic. 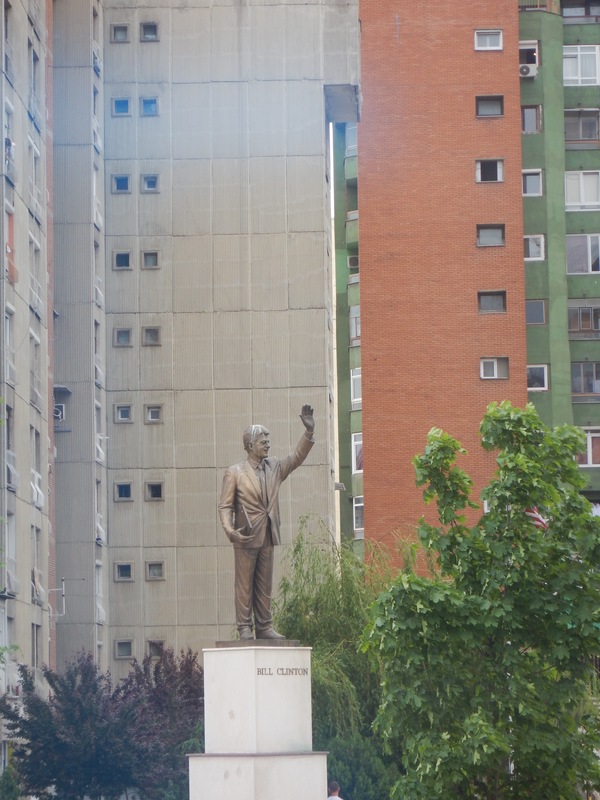 Tomorrow morning we’ll be off to Pristina, Kosovo! Stay tuned for more posts throughout the tour from each of the basses! The basses are getting ready to embark on our tour of the Balkans today, and we are really excited to go! Before we board the plane, we wanted to thank all of the people who helped make the tour possible for us. (Note: the list below is in no particular order). Thank you Veronica “Lawyer/Girlfriend Extraordinaire” Torres! Thank you Laura Tucker & Perry Hicks! Thank you Ian C Urriola! Thank you Cathy & Tom Gillaspy! Thank you Arlo and Stephanie Frost! Thank you Kate Barber & Corey Lalime! Thank you Helen Tuliene West! Thank you Hailey Alaska Barger! Thank you Laurel and Donald Young! Thank you Anita and Bill Bohn! Thank you Shawn & Paige Janzen! Thank you Allan and Linda! Thank you Allison Sarah Sage Tucker! Thank you The Shah of Sunset! Thank you Ethan (provider of all things)! The basses have survived final exams, some of us have even graduated (congrats Keegan and Bob! ), and now we are feverishly packing and rehearsing in the lead-up to tour. 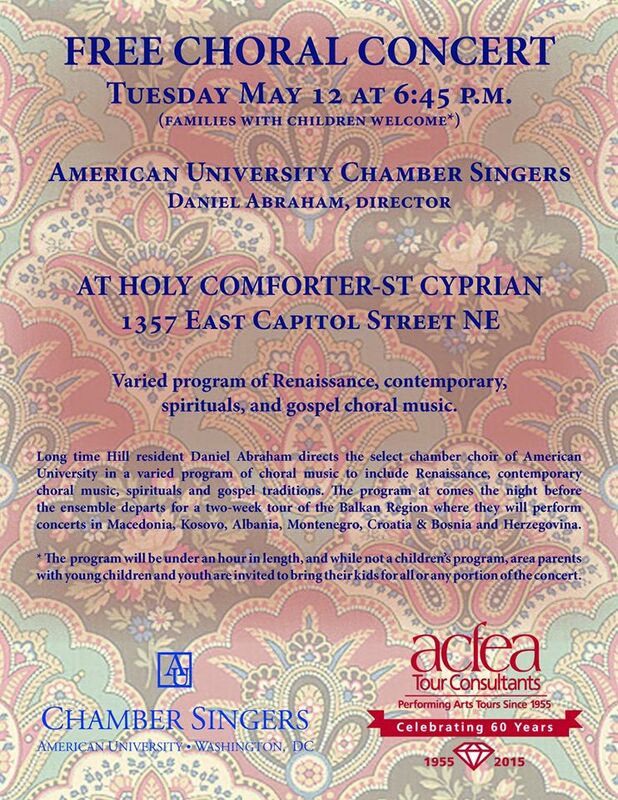 To that end, we are having a concert tonight in the Capitol Hill neighborhood of DC to feature some of our tour repertoire (details in the poster below). Stop by if you’re in the area! And keep an eye here as we’ll now start posting regularly. Thanks again for your support! We reached our Kickstarter goal! We would like to thank our Kickstarter backers so much for their generosity and support. We are very much looking forward to our tour and we’re very grateful for our backers’ help in getting us there. Stay tuned on this blog for further developments and updates while we’re on tour! The Sound of the Chamber Singers – and the basses in tuxedos! Hello everyone! We’ve reached over 1/3 of our goal in just over one week, which is amazing! We are very grateful for all of the support thus far, and for those who have shared it further. And we owe a special shout-out to Veronica Torres for being our first backer! We launched this campaign last week immediately after our fall semester concerts, and as a thank you for your support and any additional sharing or support, we have a recording from those concerts for you! This is Shto Mi e Milo, a Macedonian Folk Song about watching the girls of Struga stroll by as they go to fetch water. This piece was arranged by Daniel Abraham, our conductor. The solo that starts the piece is by Rachel Avery. Drums are by bass Matt Horanzy and Daniel Abraham. Listen for the Bass-Soprano section duets towards the end of the piece! (Note: the picture on the SoundCloud link is an outdated picture of the Chamber Singers – it will be updated as soon as we take a group photo later this month). We also took a picture of the section in concert attire – this is a rare opportunity to see us all in tuxedos! It was taken outside of the Katzen Arts Center, where we perform. Lastly, a few technical updates: first, check out and bookmark our blog, bassestothebalkans.wordpress.com, where all of these updates will be posted (in addition to the Kickstarter page), and where we will be posting updates and pictures from our tour when we’re there in May. Second, we’ve added a Frequently Asked Questions portion to our page, describing where the money will go and more about our reasoning behind the campaign. Let us know if you have any questions, and thanks again!